Ding Dong! The doorbell rings. Who could be on the other side? A friend or? The postman or someone pretending to be the postman? We don’t think much of it but knowing whose on the other side before we open the door may very well save our lives. Installing a simple device such as a doorbell camera not only provides a sense of security but makes your life much easier. Thieves often ring the bell and pretend to be a salesperson before they break in, to see if anyone is inside the house. Seeing a camera at the door might make them change their mind. And even if they don’t, the doorbell camera will capture their image and provide proof. When your away on a trip the first thing you’re worried about is the house you leave behind, these cameras give you instant updates and allow access to several people so you can give access to your trusted neighbor which will allow them to keep an eye on your house from their smartphones. Safety of your house starts at your very doorstep. The entrance to your home is the area that should be protected at all times and the Ring Video camera doorbell that tops our review list gives you complete security, is easy to install and doesn’t need a previous doorbell. It has the latest technology, night vision and so much more! And all of these features are at a reasonable price. With this camera doorbell, you will get instant alerts when someone rings the bell. Or even comes close to the door thanks to its motion-detectors. You can use the free Ring app to see, hear and talk to the guests at your doorstep from where ever you are through your smartphone or tablets. It has night vision and is weather resistant. So no matter what time of the day or what weather it is, you will instantly know who’s at your door and never miss deliveries again! It has Dual-power options meaning you can power it through its rechargeable battery or if you already have a doorbell just connect it to the doorbells wiring and get a non-stop charge. It has 720p HD video quality, motion detectors, two-way audio, night vision, 180 degrees of field vision and a lifetime purchase protection. 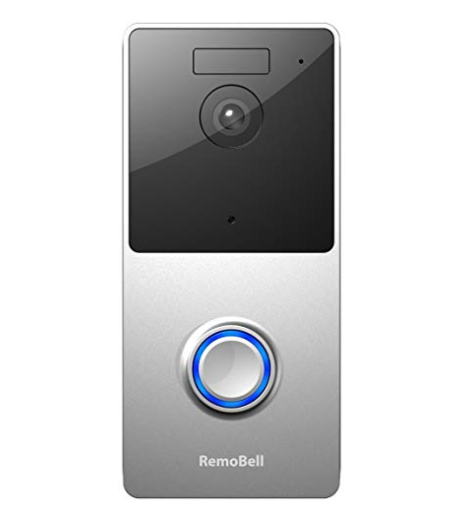 Monitor your house and greet guests in the most reliable and easy way with RemoBell’s Video Doorbell. It runs on AA batteries so there is no restriction of where to put the Doorbell Camera. It also allows you to get instant alerts and communicate with your guest live or watch the recording later. With such a doorbell in place, you will not miss a thing happening at your doorstep. The RemoBell app allows access to the same login for up to five people. Making it easier for all family members to access and see the camera recordings. And if you want you can give access to your neighbors so that they can keep an eye on your house when your away and might not have access to Wi-Fi. The set up for this Doorbell Camera is super easy and you will need no professional help. In no time your camera will be up and running and will allow you to answer the door through your smartphone. You can connect RemoBell with Alexa and Google Home to get more features and a smarter experience. It has weatherproof, Night vision, HD quality videos and a cloud storage that allows you to store videos for 30 days. 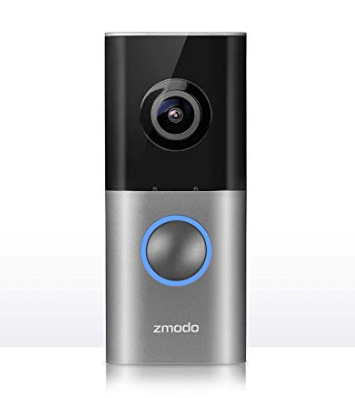 See, hear and answer the door without being there physically with Zmodo’s new Greet Doorbell. The feature that sets it apart is that if you miss a guest, Greet will play the pre-recorded video for your visitor. Access the camera from anywhere and at any time through the greet app. It allows you to adjust the view of your porch and get the best angle. It’s easy to install. Just connect it to your existing doorbell wiring, install the Greet app, name your device and you’re ready to answer the door with your smartphone. It has HD quality, certified for outdoor use, built-in LEDs, and gives you a 155 degrees horizontal viewing angle that you can control digitally. It even has a 2-way audio and light sensors, what more could you need! Get priority to the safety of your house and get a Gosund Doorbell Camera. It has almost the same features but this device allows you to FREE LIFETIME CLOUD STORAGE. So no restriction and all your video recordings stay in one place. Left kids home alone? Worried they might answer the door to strangers? This Doorbell will give you instant alerts when someone is at the door and allow you to answer from anywhere through your smartphone and talk to your visitors at any time. There is no headache of wiring with this camera. It runs on batteries and has a special low power consumption technology which sets this apart from the rest of the cameras on this review list. Keep your house safe even in the dark. With this devices’ night vision quality and recording ability, you can get instant alerts if someone is lingering outside your doorstep at night. 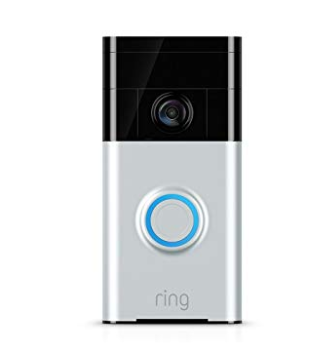 Two-way audio and video, night vision, HD quality, PIR motion detection for all iOS and Android devices and much more is what this simple Doorbell camera offers. When it comes to the security of your home you don’t want to make any compromises and get the best safety devices possible. Knowing who shows up at your doorstep when you’re not home is made easier with Aunex Upgraded Doorbell Camera. Get a Wi-Fi Wireless Doorbell Camera and monitor who comes and goes by your house when your home and when you’re not. Aunex Doorbell Camera allows you Real-Time Video Two way audio so you can interact with your visitors live when you’re not home. This camera doorbell gives you 166 degrees wide angle view! You won’t miss a single thing with this camera at your doorstep. It leaves no blind spots at the very entrance of your house. 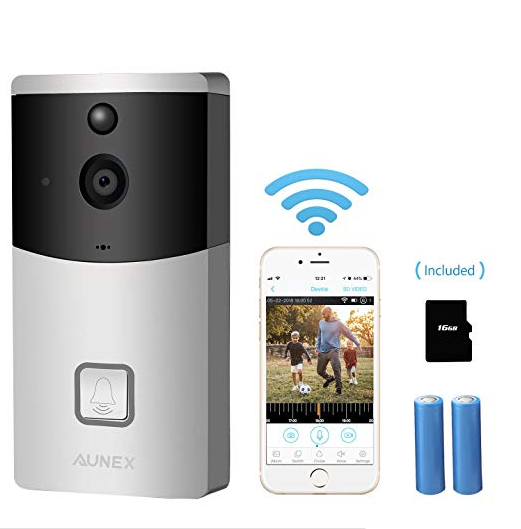 Another special feature of Aunex Doorbell Camera is that it has a Build In 16GB SD card that allows you to store all your previous and current video recordings in one place. And there is no time restriction so videos will stay in the SD card till you delete them to make space. This camera has all the features that you could need and is at a fair price. It has a two-year warranty and a 30 Day Refund Guarantee! 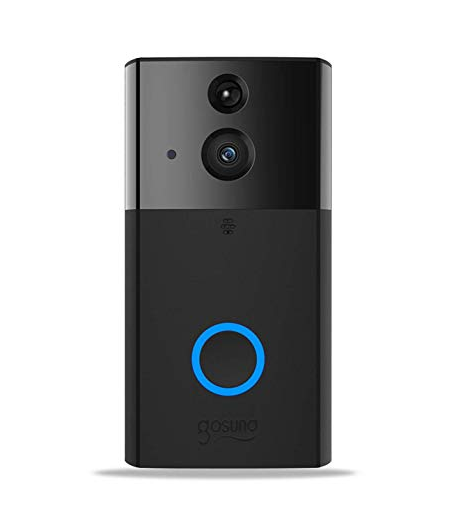 There is no better and cheaper camera doorbell than this. 720p HD video quality, two-way audio, Night vision, PIR motion detection are some more the features this camera offers. Technology has advanced a lot and because of it, we can make our life much safer and easier by adopting a few devices like the ones mentioned in this review. Threats these days can come from anywhere. Taking small measures such as installing a Doorbell camera will give you a much-needed peace of mind and security for your loved ones when you’re away. We don’t give these matters as much importance as we should because the safety of a sanctuary starts from its entrance. Leaving your kids alone even with a babysitter you still aren’t at peace until you know who is coming and going in your absence. These few best doorbell cameras mentioned in the review have everything you need for safety, relaxation and a completely new way of life! Don’t wait long and install one of these cameras that will monitor your home for a lifetime.